Was the Path of Souls Ritual a Worldwide Phenomenon? It was in the late 1990s and early 2000s that two Irish researchers began to unravel the mystery of Newgrange, a famous Neolithic tomb mound with stone chambers accessed through a long, narrow, stone-lined passageway. Newgrange is dated to around 3000 BC. The entrance to the interior chambers is aligned to the Winter Solstice sunrise, but it was the unusual, cross-shaped interior passage and chambers that intrigued the researchers, Anthony Murphy and Richard Moore. Through a series of studies done at the site, they concluded that the interior chamber was built to mimic the constellation of Cygnus. They also found that another Neolithic stone chamber mound, found about 9 miles to the southeast, was on the Winter Solstice azimuth from Newgrange. That mound, called Fourknocks, was also constructed around 3000 BC. Using computer software, the researchers found that the entrance of Fourknocks was designed to view Deneb, the brightest star of Cygnus, on the night of the Winter Solstice in 3000 BC. I was privileged to meet with Murphy in the mid-2000s and was impressed with his meticulous research, which can be accessed here. Just a few years later, in 2003, Andrew Collins made his first visit to the ancient Turkey site of Gobekli Tepe. Collins immediately began issuing a series of articles on the 11,000-12,000 year-old complex of stone temples at Gobekli Tepe, which alerted the alternative history community to its significance. Presently, Gobekli Tepe is the oldest known megalithic site in the world, however, it is believed that there are similar ancient structures buried in the same general area of southeastern Turkey. In his 2006 book, “The Cygnus Mystery,” Collins asserted that the massive stone chambers at Gobekli Tepe had been built to target Cygnus, especially the star Deneb. In 2014, Collins’ book, “Gobekli Tepe,” presented convincing evidence that the stone temples at Gobekli Tepe were erected to allow sightlines to Deneb through openings in carefully placed stones. In 2015, two Italian academic mathematicians published a peer-reviewed archaeology journal article confirming that several of the stone temple pillars at Gobekli Tepe were, indeed, aligned to Cygnus. However, in 2006 Collins also asserted that various sites in the Americas were aligned to Cygnus. These included sites in South, Central, and North America. It was the possibility that Native American mounds, which first appeared around 5700-years-ago, showed alignments to Cygnus that were most intriguing to me. A subsequent series of studies, conducted by the present author with Collins’ assistance, found that several Native American mound builder sites in Ohio, including the Newark earthworks, the Portsmouth earthworks, and the Marietta mound complex, showed definite alignments to Cygnus and Orion at the Winter Solstice. These were sightlines made from the tops of key mounds across other mounds that showed the rising and set point of Orion and the setting of Cygnus. More research showed that other mound sites in America showed the same alignments. These include mound complexes at Winterville and Anna in Mississippi, at Moundville, Alabama, at Angel Mounds, Indiana, and at three mound complexes in Louisiana. All of the details can be found here. The sightline alignments to Orion and Cygnus were key features in the Path of Souls’ ritual, a ceremony performed to send deceased souls to the stars. The Path of Souls was perhaps the most important belief system held by America’s ancient mound builders and it partially explains the geometric earthworks and large mound complexes constructed by a sequence of native cultures. The earliest evidence (currently) known for the belief system in America is from the Adena Culture circa 1000 BC. The beliefs became more complex during the Hopewell period and peaked during the Mississippian era, lasting until the decimation of Native American tribes with the arrival of the Spanish in the 1500s. The ritual took place on the Winter Solstice and began at sunset. The idea was to target Orion’s Nebula (Messier-42) and assist the souls to leap to that precise spot in the sky— an ogee—a portal to the Milky Way. From there, the soul made its way to Cygnus and Deneb where it entered another portal and made its way out of the sky world. The ritual involved the cremation of remains, the manipulation of symbolic objects, the use of ritualistic music and rhythmic movements, various mind-altering substances, and the controlled movement of groups of participants through carefully designed earthworks throughout the entire night. It ended at dawn, just after the setting of Orion, which occurred just before sunrise. It has been speculated by Collins and Murphy & Moore that Cygnus gained its importance as long ago as 16,000 BC when Deneb was the Pole Star. Evidence for this was found in caves in Lascaux, France on cave paintings dated to that early time period. Was this the time when the ideas about the Path of Souls developed? If so, how did the idea find its way to the Americas? Until the discovery of Gobekli Tepe, the oldest known megalithic temples were on the small islands of Malta. Malta is about 50 miles south of Italy in the Mediterranean Sea and the islands cover about 120 square miles. The oldest stone temples on Malta date to about 3800 BC. Several of the temples have been shown by archaeologists to have astronomical alignments to the solstices. However, there is little agreement on any stellar alignments, although some have been suspected and proposed. The temples are often on high points along the sea giving a vast and unobstructed view of the horizon. Using the computer software Starry Night Pro and the precise GPS of several temple sites in Malta, the azimuth setting points and movements of Cygnus and Orion were calculated for several of the temple complexes. Two of the results are described below. 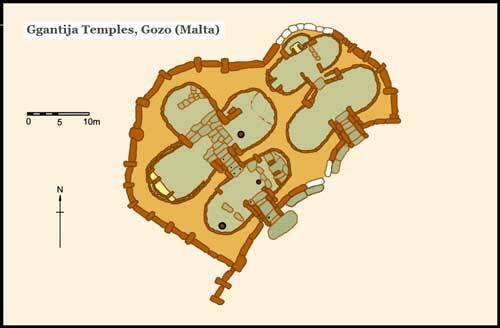 The temple complex of Ggantija is on the small Malta island of Gozo. (The illustration, by Hamelin de Guettelet, shows the orientations of the Ggantija temples.) The oldest temple at the site is dated to 3600 BC. The structures were built from massive stone blocks and were once covered by a roof. The entrances are found on the southeast and lead to various interior chambers. Computer simulations by Starry Night Pro revealed that the orientation of the chambers pointed to the northwest and the setting of Cygnus on the Winter Solstice in 3400-3000 BC. The shapes of the interior chambers are also somewhat similar to the interior shape of Newgrange in Scotland. 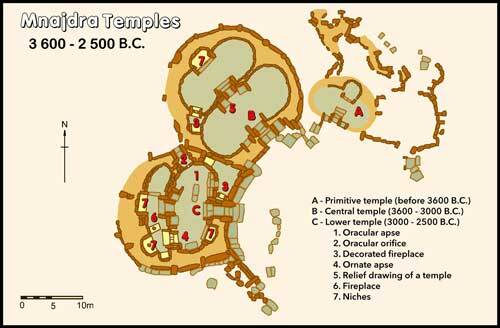 Another massive temple complex is Mnajdra, located on the southern coast of the main Malta island. (See the illustration below by Hamelin de Guettelet.) The entrance of Temple “B” is oriented to the southeast, however, the entrance and inner chambers also align to the setting of Cygnus on the Winter Solstice in 3000 BC. From the interior of the temple looking out the entrance, the rise of Orion would have been visible shortly after dusk. Of greater interest is Temple “C,” which has its entrance facing east. Inside this temple, on the northeast end, is an “ocular orifice,” (labeled “2”) an opening from which one can view to the outside. From the interior (labeled “1”) it was possible for the setting of Deneb to have been viewed on the Winter Solstice through this orifice at 10:00 PM in 3000 BC. If these alignments are correct, there is reason to suggest that the ideas behind the Path of Souls ritual, clearly present in the Americas by at least 1000 BC, comprised a worldwide belief system.